I recently returned from a fantastic whirlwind week in Seattle, where my mother and I attended the Northwest Flower & Garden Festival. In between my presentations, including a riveting ‘Container Wars’ challenge (yes, that’s me showing off my blue ribbon!!) I had plenty of time to wander through this year’s display gardens, the theme being ‘Gardens of the World’. I wanted to share with you three display gardens that felt were particularly stunning this year and takeaway ideas that you might implement in your own garden. Designed by Folia Horticultural & Design, this is a garden that will transport you to a chic London neighborhood, allowing you to peek through the evergreen walls of yews to a most desirable entertainment area. Typical with all garden shows, it’s really easy to quickly overwhelm all of your senses with the onslaught of colors, sounds, scents, etc. In your garden, you can achieve a similar effect through the use of strategically placed mirrors. One of my favorite tricks is to discreetly hang a mirror on a fence or wall, surrounded by plants to soften its effect. To detour just a bit – here are some examples from gardens that I’ve seen that have a similar effect. The first was created by a wildly creative client of mine who found these antique doors, had the glass replaced with mirrors, and hung them in the very back of her garden. Gorgeous, aren’t they? The mirror is hung lower down on the fence and reflects a small fountain that she and her husband created for their hummingbirds. How’s this for a pop of color? This was the side-yard of my good friend, and designer, Susan Morrison. According to Susan, everyone who saw the round mirrors would walk over and peep through, certain they were cut-outs offering a view to the front yard. In fact, they were inexpensive mirrors she found at Target! Okay – let’s get back to the Notting Hill garden, shall we? Never in a million years would I think I’d be saying ‘wow, I really like those white rocks,’ but I do! When I think of white rocks in the garden, I think of hours of back-breaking work hauling them away (maybe it’s due to their prolific overuse in the 1970s here in California), but these rocks are stunning. These are larger than the more common 1-inch size, and therefore make a statement in this garden, repeating the crisp white color echoes of the variegated foliage and white flowers. Created by Nature Perfect Landscape & Design, and described as a stylized Chinese garden, it’s similar to the Notting Hill garden above in that it’s also a green-and-serene garden partially surrounded by enclosed walls. The walls and moon-gate create mystery and a feeling of peeking into someone’s private, secret garden. The stunning moon gate is by far one of the most exciting features of this garden. The circular cutout inherently creates intrigue, directing the viewer’s perspective which leads to the white Gonshi (scholar’s stone) focal point. People couldn’t get enough of this moon gate, with crowds 4-5 people deep! What is it about a moon gate, anyway? A circular shape is quite effective in focusing the line of sight, directing the view to a particular point in the garden. Consider these other examples, found in the San Francisco Conservatory of Flowers and New York’s Stonecrop Gardens . The shape, however, doesn’t always have to be circular to guide perspective. For example, take this jaw-dropping arched wall from Filoli’s beautiful winter garden . The colors in this garden are various shades of green, with the occasional bulb providing a pop of color. Serene, yet definitely not tiresome, right? Designed by Iftikhar Ahmed of Treeline Designz, this Persian ‘paradise garden’ is influenced by its royal namesake, embracing the fourfold garden concept with water at its center and dividing the quadrants. Similar to the other gardens above, this also is enclosed by walls with intricate cut-outs and doorways from which to view and enter the space. I appreciate its simplicity in terms of plantings, with the emphasis on the structure of the garden. Color is clearly present, however, thanks to the tulips, stenciled designs, and stunning glass teardrops. A simple takeaway from this garden would be that you can create a formal style garden on a much smaller scale. We created this garden, for example, using a simple parterre concept. There are four symmetrical raised beds all placed on a bed of gravel with a fountain which will go in the center. 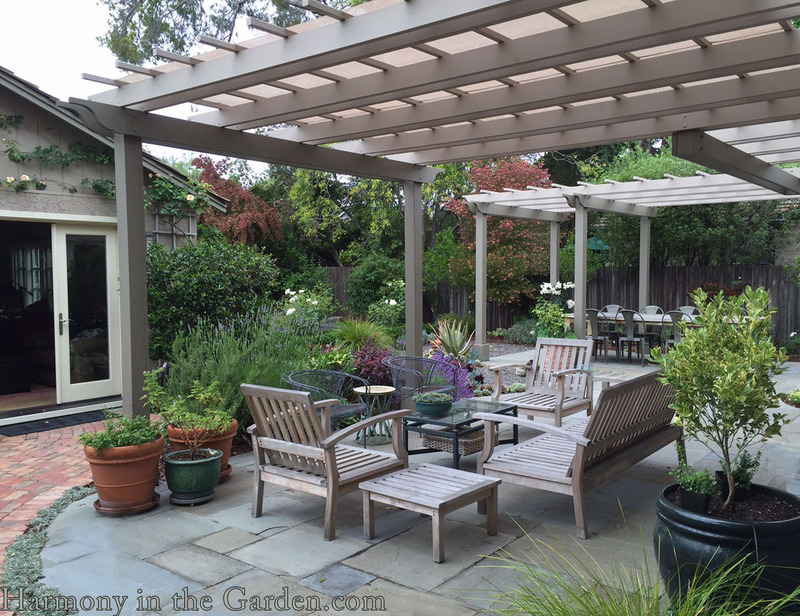 More about this garden (including before-and-after pics) can be seen here. Or, as in the case of this courtyard garden at The Cloisters, formality has been created with four paths leading to a small, central fountain. I hope a few of these gardens have given you a bit of inspiration! Please stay tuned for my next post, where I’ll share some of the fantastic small spaces that were tucked in here and there throughout the show. Until then – hurry up, Spring!!! I was only able to attend Wed at the NW Flower and Garden Show. I’m so glad I got to hear your talk. You had a great presentation with photos and you gave zones for the plant list. I checked out your book Garden Design and after renewing it went ahead and ordered the book. I’m in a zone 6 so they say but we of Central Oregon know better. Our temperatures will drop 40 degrees most summer nights so we try to buy plants in the 4-5 zone. We can also so get a frost or freeze most anytime of the year. Not complaining, we have beautiful mountain views and hiking trails. Lots of wildflowers that know how to survive and plan to plant more native plants. I’m new to this newsletter and thanks for sharing. I love your photos. A teaching moment. They help me see things that I wouldn’t see through my own eyes. Thank you, Linda, I’m so glad you enjoyed seeing the show through my lens! Definitely enjoyed your article and photos from the show. Very inspiring. Thank you, Joyce, glad you enjoyed this! How fascinating to read your interpretation of the Gardens at the show! It brings appreciation of the wonderful designs to a whole new level. Thank you for including our mirrored doors in the back garden that disguised the cinderblock wall of the next property and brought to life a dark and dull corner. It was the result of inspiration from a garden tour! Thanks for a peek at the show! Beautiful gardens! I have some old wooden windows just begging for mirrors now! You’re welcome, Donna, and once you transform your old windows I’d love to see a pic!